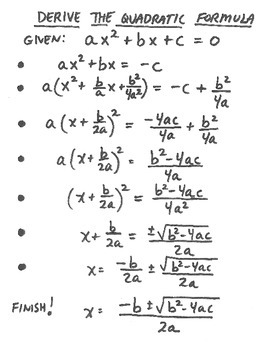 -The quadratic formulas is derived from completing the square. This step by step procedure is included which can easily be projected. 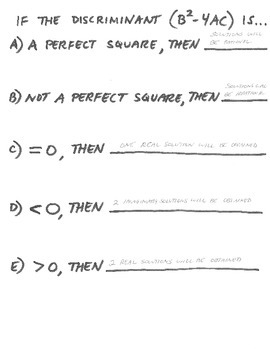 - notes are included that describe what kind of solutions will be obtained if the discriminant (b^2 -4ac) is a perfect square, not a perfect square, =0,>0,<0. This forces to make your students think! 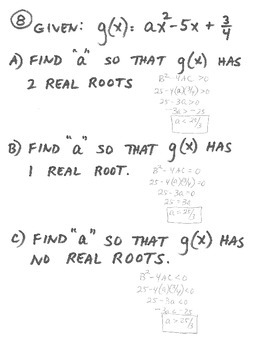 -Practice problems are included that encourage students choose the best method (factoring, completing the square, or quadratic formula) to solve various quadratic equations. Solutions are included as well done step by step. -Apllication problems regarding the discriminant are also included.